To have a good time camping, kids need meals they will like. Plan your breakfast, lunch and dinner menus ahead of time with them in mind and don't forget to bring some desserts. Make sure you have all the spices and condiments needed for the meals along with cooking utensils and pans. Get your spices ready for meals in small ziplock baggies and label the meal on each one. Take small amounts of items like mayo and butter, and buy small disposable salt and peppers. This will make cooking easier if you are prepared and the small quantities helps the packing. Print out our camping checklist to be sure you remember everything you need. Buy my Kindle book for $2.99. 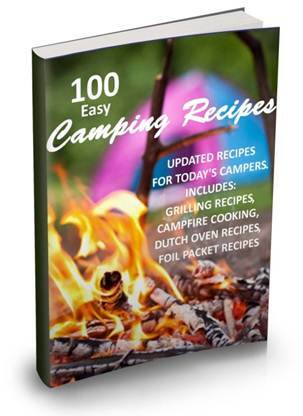 I wrote a Kindle book called "100 Easy Camping Recipes" that will solve all your menu problems. It's practically the only modern camping recipe book on the market. Check it out! "Hiking" with the kids who like to stop and smell the flowers, collect pretty rocks, hit the trees with sticks is sometimes a chore. Walking distances with the kids can be fun for them if you tell them you are searching for an old cave or an abandoned cabin in the woods. Or hike to a lake with your fishing poles or to skip rocks. When they start to get tired, sing songs or play games like "I Spy". Of course most of your outdoor activities with the kids is spent exploring the woods or playing around the campsite. But if it rains or they just get bored, here are a ton of activities suited for camping. 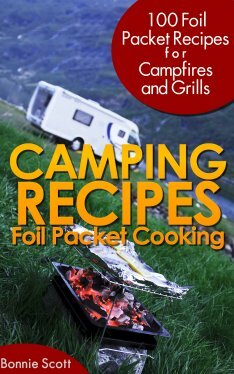 Just be sure to browse through these camping crafts before you leave, so you can bring along the supplies needed.